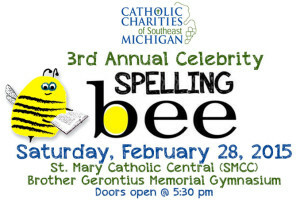 Enjoy Monroe County police, firefighters, and others competing in the 3rd Annual CCSEM Spelling Bee on Saturday, February 28, at St. Mary Catholic Central High School in Monroe! This uproariously fun competition for adults will include a cash bar, raffles and door prizes. Doors open at 5:30 pm and admission is only $10 each or two for $15. Learn more: 734-240-3850 or billsunderland@hotmail.com.